1. What does the EKG below show? 2. 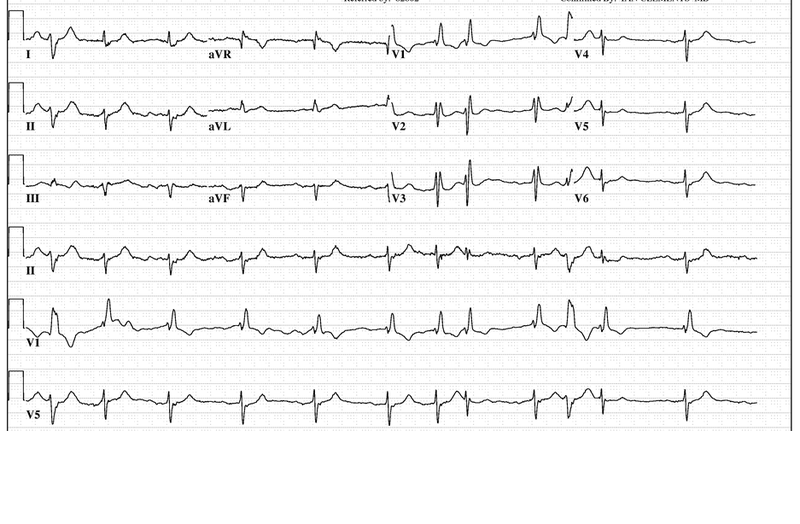 What would be the key concerning Chief Complaint of the patient's presentation to the ED given this EKG? 3. What is your disposition/management plan if they present with the concerning chief complaint and this EKG? Rate - normal. Rhythm – regular (although it looks irregular at times, it’s only because there are a few premature supraventricular beats). Ultimately, there is a P wave for every QRS and QRS for every P, so regular. Ischemia - none. Intervals…. let’s start with the QRS.... it’s wide (>120ms or 3 tiny boxes). In fact, it looks like we have a right bundle branch block. Now when you see a right bundle, you should always take a quick look for associated conduction disease. Remember conduction goes, SA → AV → Bundle/Purkinje (which is made up of the left and the right bundles). The left bundle can be separated into two parts: left anterior fascicle and left posterior fascicle. (see image below). So now let’s take a look at the axis to see if there’s blockage of the left bundle, specifically the left anterior fascicle. (This is one of the few times I think axis ever matters). I don’t think there’s any point to look for an anterior fascicular block in isolation, because an anterior fascicular block by itself is harmless (because you would still have left posterior fascicle and right bundle working which is fine). But you should look for it when you see a right bundle. Here is a simplified approach to diagnosing a left anterior fascicular block (the technical criteria gets more complicated, but remembing this, it will work >95% of the time). Now with the RBBB, the QRS is already >120ms, so you don't need to worry that. Just looking at the axis, I is up, aVF is down, and II is down so… there is a left anterior fascicular block. So the right bundle is out. The anterior portion of his left is out. The only potential normal conduction remaining in this lady’s heart through the Purkinje system is the patient’s posterior fascicle of the left bundle. Diagnosis for a solitary posterior fascicle block is kind of tricky to diagnose. Fortunately however, it is really rare to see an isolated posterior fascicle block as the other two (right bundle and left anterior fascicle) will get diseased first because the left posterior fascicle has dual blood supply. In fact, I don't even think it's necessarily important that we as emergency medicine physicians know what a solitary posterior fascicular block looks like. But imagine if you took out the entire posterior fascicle too. You would now have no functioning Bundle/Purkinje system as the entire system is blocked. So what would you get? Third degree heart block, i.e. completely discoordinated and slowed conduction through the entire conduction tract from AV node to ventricles. A bifascicular block in and of itself is only concerning if the patient is having symptoms of syncope (they usually don’t) because again, they have some normal conduction through the Purkinje system still in place. However, we’re not done yet with this EKG. We covered the Bundle/Purkinje system, but we have to keep looking for signs of disease of the conduction system (now looking above above the Bundle/Purkinje system). We established that the QRS is long, but what about the PR? The PR is in fact long (>200ms or 5 tiny boxes or 1 big box). A prolonged PR interval by itself recall is a first degree AV block (while it’s called an AV block, technically the disease might not be in the AV node). A slowed PR could be the AV node, or in this patient, a diseased, but not yet completely blocked left posterior fascicle. We can’t know for sure from the EKG alone and would need an electrophysiology study to figure this out. So now we have a RBBB + left anterior fascicular block + first degree block. This can be called an incomplete trifascicular block (tri = right, left anterior, and presumably partial block w/ slowed conduction of left posterior fascicle). Again, we don’t know for sure that the slowed PR is due to fascicle disease, but in a patient with syncope or pre-syncope symptoms, we should presume the worse pending an EP study. A complete trifascicular block would look like the above EKG except with complete heart block and complete dissociation of the P waves and QRS complexes. The QRS would be slower as well since it would have to be a ventricular escape rhythm.Complete trifascicular block is an emergency. They need pacing and admission for a pacer, as they’ll be super bradycardic. In an incomplete trifascicular block, symptoms of pre-syncope, syncope, or periods of bradycardia would warrant admission for consideration of pacemaker placement or EP interrogation. Because the patient may be symptomatic because they are jumping in and out of a complete trifascicular block. Disposition: The patient presented with syncope. Presumable following a run of third degree block (complete trifascicular block). The patient was admitted and a pacemaker was placed.